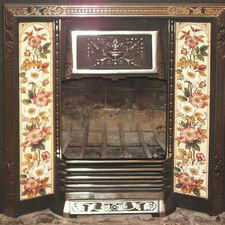 These English art side tiles adorn a small Rumford fireplace in an 1899 Washington DC home. These tiles are a restoration of the existing fireplace. 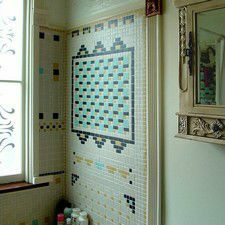 The matte mosaics were used to re-create motifs in tile found in the Dupont Circle area, in homes dating from 1895-1905. Before undertaking such a job, it is critical to draw detailed diagrams beforehand of the final design. 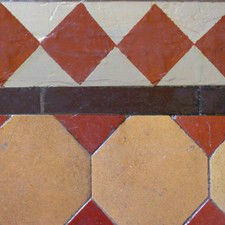 Encaustic tiles generally have a matte (unglazed) finish. These tiles, because they are in a foyer, have been heavily used, patched, and finished with a durable clear epoxy finish to help prevent further crumbling. 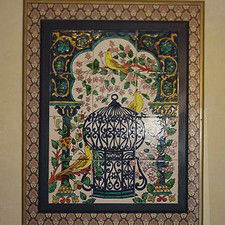 These Tunisian tiles, from a flea market, look wonderful when mortared to the wall. We recommend a backer board for a good grip. Pack tiles closely and use a non sanded grout. Use a level to outline your frame before tiling. Double framing allows a decorative wallpaper border to be added. We have experience in the restoration of historic tile floors, in their cleaning, creation of matching replacement tiles, and design of mosaic patterns characteristic of the Victorian era. 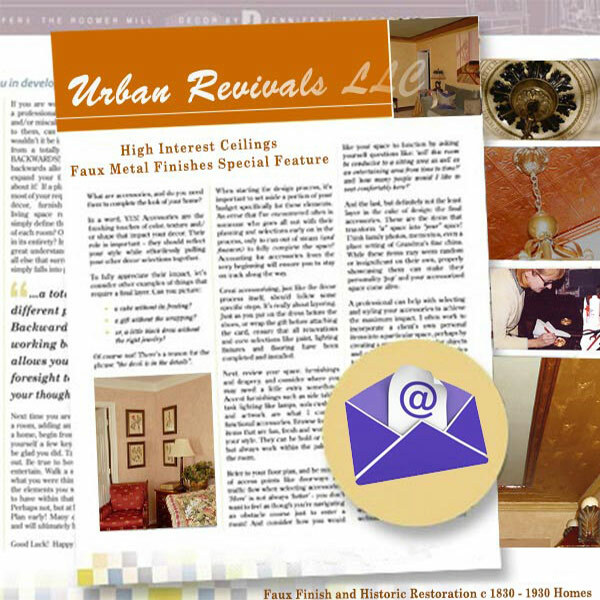 Our tile work has been featured in Old House Journal.